I've gotten a couple of questions for clarification on the Twisted Loop stitch in my Flora neck warmer pattern on Knitty.com, so I figured I'd provide a longer explanation and photos of the steps. The stitch is definitely one of those that is easier to do than to explain! 2. Bring the yarn to the front as if to purl. Using whichever hand is easier for you, pinch the yarn about 3 inches (8cm) from the knitting, and bring the yarn to the back of the work as if to knit. You now have a 3-inch loop hanging in front of your knitting. 3. Now you need to keep the loop stable while you twist it. Using whichever hand is easier, hold the base of the loop (where the yarn is closest to the needles) against the right needle. (In the photo, I am using my left thumb.) Use a finger on your other hand to pull the loop away from the knitting (see Photo 1). 4. Use finger in the loop to twist the loop (see Photo 2) around and around in one direction until the loop is so twisted that it starts to twist back on itself. 5. Slip the twisted loop from the tip of your finger onto the right-hand needle (see Photo 3). I use the other fingers on my right hand to tug at the center of the doubled loop at the same time (see Photo 4), but you can also do this as a separate step. The goal is to get the doubled loop to form a short, straight twisted cord (see Photo 5). Each twist creates a new loop, or "stitch," on the knitting needles. In the Flora pattern, you don't need to worry about securing the loops because the next row is a decrease row in which the loops are knit together with the other stitches. 6. K1, Slip the twisted loop over the knit stitch to lock the twist and eliminate the extra "stitch." Continue with step 2 above. Thanks for posting this illustration! I'm now making my second flora and I think it's a BRILLIANT pattern- there are so many ascot thingies like this in the fall fashion magazines. I think every woman I know is going to get one for Christmas. Thanks for the explanations! I'm French, and I hadn't really understood what you meant with "Twisted Loop". 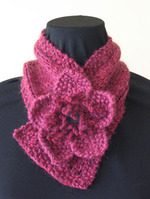 Now I have a beautiful Flora scarf! I am searching for knitting magazines in French. I am originaly from France, I do not understand American patterns. Could you tell me,where I can find & purchase knitting books/magazines from France ?, I have search the Web,in vane.I appreciate it. Love your "Flora" pattern. I have just finished making the Petal and am wondering what to do with the 10-inch tail. Thank you for your help.